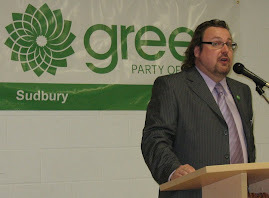 Sudbury Steve May: What Does Thomas Mulcair's Leadership of the NDP Mean for the Green Party of Canada? What Does Thomas Mulcair's Leadership of the NDP Mean for the Green Party of Canada? I’ve been giving a lot of thought lately to what Thomas Mulcair’s recent ascension to the position of Leader of the New Democratic Party (and to Her Majesty’s Loyal Opposition) might mean for the Green Party of Canada. What I’ve concluded after considerable thought is that there are too many variables in play right now to be certain of anything, but generally speaking, Mulcair’s leadership of the NDP could ultimately prove to be very problematic for the success of the GPC. In December of 2011, I predicted that Peggy Nash would take the mantle of the NDP’s leadership. My prediction was based on an “anybody but Mulcair” movement arising within the NDP pre-convention, mostly led by Western Canadians. I did not believe that Nathan Cullen would be able to pull off an upset victory, which left only Nash, Topp, and Dewar as serious contenders in my mind (and I had to think that Dewar would be seen to be at a disadvantage, even by Westerners, given his lack of French-language skills). I also did not anticipate that Brian Topp would do as well as he ultimately did, given that I’ve always thought Topp lacks a certain fire in his belly (and I still think this, despite his strong showing at the convention). For me, Nash was the logical inheritor of Jack Layton’s leadership style, and I figured that the NDP’s membership would have gone looking for more of the same. But even though I picked Nash to win, I had to acknowledge that the needs of Quebec (and maintaining the NDP’s success in that province) might have outweighed the needs of the rest of the Party. But I still didn’t think that the NDP would hand the leadership to someone with such tenuous roots in the Party, and who appeared to want to turn the NDP into the Liberal Party. But, the NDP has done just that, in choosing Thomas Mulcair as their Leader. And in the process, they might have just chosen the next Prime Minister of Canada, if the Party faithful decide to ride it out. First, let me backtrack a little bit. I really don’t believe that Mulcair wants to turn the NDP into the Liberal Party. I’m merely parroting a line which is playing out in the popular media right now. In fact, if you take a close look at the policies which Mulcair is championing, it’s very clear that they are almost entirely those which the NDP membership has approved (and even Mulcair’s position on the Israeli/Palestinian conflict can be seen as a nuanced interpretation of the NDP’s policy). Given Mulcair’s clear acknowledgement of the primacy of the Party’s policy, I don’t at all buy that he wants to turn the NDP into the Liberals. That Mulcair is gunning for support from disenchanted Liberals, however, is quite clear. And who can blame him? The NDP, in picking Mulcair over any of the other candidates (except possibly Nathan Cullen) have determined that they want their Party to govern, rather than to continue to exist as an opposition party. Selecting Brian Topp would almost certainly have guaranteed that Government would have continued to elude the NDP, as Topp, who lacks much in the way of personality, would have had his character broadly assassinated by the Conservatives well in advance of the 2015 election. Likely the same fate would have befallen Nash too (although not necessarily, despite the fact that she and Topp have strong histories with organized labour. I believe that if the Cons would have tried to vilify Nash, there might have been a backlash, especially amongst women voters. But Topp would have been completely destroyed, in my opinion). The Conservatives are going to have a much harder time defining Thomas Mulcair on their own terms, I believe, given Mulcair’s credentials, and his character, along with his lack of roots in the NDP. Not that this means the Cons won’t try, and maybe they’ll even succeed. Ultimately, the success of the NDP is going to in part be decided on just how successful the attacks from the Conservative Party are. Coupled with the NDP’s Supreme Court-defying Sherbrooke Declaration regarding the threshold for the success of a Quebec referendum on separation, a good case could be made that the NDP is pandering to Quebec nationalists at the expense of the rest of Canada. While this might play well in Quebec (unless Quebecers decide to choose the real thing in 2015 in a resurgent Bloc Quebecois, rather than the NDP’s pale imitation), it may yet prove to be Mulcair’s Achilles Heel in the rest of Canada. However, if Canadians find themselves clamouring for change in 2015 (and I think that after 4 more years of despicable, mean-spirited government by the Conservatives, they will be), the NDP’s soft-on-separatists stance might be overlooked, especially if a fire-breathing Mulcair can demonstrate that he’s got what it takes to also be Prime Ministerial. And since Mulcair now has some time to start acting like a Prime Minister in-waiting, I have little doubt that he will present a credible rallying point for progressives and others disenchanted with Harperism. Mulcair’s popularity ultimately spells bad news for the Green Party of Canada, which will continue to experience difficulties in getting its message out to voters. Although the Green Party is not a party of the left, the mainstream media continues to portray it as such (just as the MSM continues to insist that the Liberal Party is a party of the left – and perhaps in contrast to the Conservative Party, the Liberals are just that, but anyone who takes a critical look at the Liberal Party would never conclude that they’re left-wing). So, if the Green Party continues to be portrayed as a left-wing party, despite it being so, and voters are flocking to the NDP and Thomas Mulcair with the hopes of defeating Harper, Greens will continue to be overlooked except maybe in a few ridings where strong candidates can make a case for serious contention through the sheer force of their personality (and believe you me, the Green Party has not been cultivating these types of politicians, and isn’t likely to enlist many “star candidates” for the upcoming election). Another problem for the Green Party is Thomas Mulcair’s perceived focus on the environment. Already, in a way that Jack Layton never did, Mulcair has come out as a strong fighter for all things environmental. It’s clear to me that he “gets it”, more so than most in his Party. As a former provincial Minister for the Environment in Jean Charest’s Quebec Liberal government, I guess that’s to be expected. Sure, I completely disagree with Thomas Mulcair’s championing the NDP’s Cap and Trade carbon pricing policy, but let’s face it, amongst the average voter, the best mechanism for putting a price on carbon likely pales in importance to the notion of being seen to want to take action on the environment, and maybe moving towards a low-carbon economy. I know that there are many others who share my concerns about Cap and Trade, and some of them are within the NDP, but in the grand scheme of things, let’s face it: Mulcair is going to talk the talk on the environment and will make carbon pricing a decent component in the 2015 election campaign. And that should go over well in Quebec. Voters who are concerned about the environment will be left with a choice of whether to support the Green Party because we Greens have better policy, or whether to support the NDP because they might form government and actually be able to implement an inferior policy (but one perceived as taking necessary action nonetheless). I would think that most voters, if those were the only two choices, would be inclined to choose action. Generally, then, it seems that Mulcair might prove to be an extremely significant threat to the Green Party. But there are a couple of wild cards which could end up hobbling Mulcair. First, there’s Quebec itself. As much as I’m reluctant to put much faith in polling (especially lately, as there’s been a bit of an unorganized effort to mislead pollsters), the fact is that the Bloc Quebecois seems to be gaining in popularity in Quebec. Should the Bloc continue to rebuild itself, it’s quite possible that the NDP could start to be seen as a one-hit wonder, with a best-before date well in advance of the 2015 election. A resurgent Bloc could force the NDP to try even harder to hold onto its Quebec seats (which is likely the approach they’ll take), which might mean that the perception of the NDP acting in the interests of the rest of Canada might continue to take a bit of a beating. This will be problematic in the West in particular, and it’s in British Columbia where the Green Party probably has the best opportunity for additional electoral success. Alternatively, the NDP might decide to write-off holding onto Quebec, in which case they’ll move towards more centrist policies in a bid to pick up suburban ridings in Ontario (and possibly Calgary/Edmonton) and focus on the West. This strategy too favours the Green Party, as a more centrist NDP which starts emphasising the needs of the West will have to tone down the rhetoric on environmental policies. This would certainly create some room for the GPC on the B.C. coast, and possibly in southwestern Ontario. But I can’t see the NDP abandoning Quebec. Although it may be likely that the NDP tries to do both: shore up Quebec with pro-environmental rhetoric in French, and pander to the west by de-emphasising the environment. This approach too could favour the Green Party, as Greens are not especially strong in Quebec, and could stand to gain by making a strong case the NDP is the Party of greenwashing. Or jump on the “NDP = Pro-Separatist” bandwagon. However, I’m personally not ready to get excited about a resurgent Bloc Quebecois. I have to here put the interests of my country ahead of the interests of my Party, and I’d certainly be very pleased to see the Bloc bumped into oblivion in the next election. It galls me to no end that in their pursuit of power, the NDP have played partisan politics by pandering to separatists in Quebec. For me, the NDP absolutely and clearly lacks principles when it comes to Quebec’s role within a united Canada, and I stand with former Liberal Leader and Clarity Act author Stephane Dion on NDP’s Sherbrooke Declaration (see, “Stephane Dion: NDP’s separatist pandering threatens national unity”, National Post, March 12/12). We here in Northern Ontario should be particularly incensed that our NDP MP’s continue to support their Party’s playing to both sides in the separation issue, at the risk of our nation. So that’s why I can’t get excited about a resurgent Bloc, even if it would benefit the electoral chances for Greens elsewhere. Another wild card for consideration will be the role which Thomas Mulcair assigns to former leadership candidate and B.C. MP Nathan Cullen. Cullen himself is rapidly becoming a significant rallying point within the NDP, and if Cullen eventually emerges as the NDP’s B.C. deputy (which isn’t an official position, but it’s fair to suggest that NDP MP and Deputy Party Leader Libby Davies currently occupies that role), it could spell bad news for Greens, given his rising popularity. Either way, though, British Columbia will remain an electoral battleground in 2015. What might work in favour of the Green Party would be the election of an NDP provincial government in B.C. next year, as the B.C. provincial Liberals seem set on a path to self-destruction at the hands of both the NDP and the new Conservative Party. How could an orange wave at the provincial level in 2013 benefit Greens in B.C.? Conventional wisdom would seem to suggest that a popular provincial government should pay dividends for federal cousins, and I actually buy into that argument. The problem in B.C. for the NDP, however, is that I have absolute confidence that an Adrian Dix-led provincial government will reveal itself to be an unmitigated disaster for that province by the time the federal election is called. While this should create new opportunities for Conservatives, it also should create some room for the Greens. Of course, if the B.C. Green Party figures out a way to send a Green to Victoria in 2013, that too would be a big help for the GPC in B.C. That’s why Greens involved in the national party should be prepared to lend a hand to Jane Sterk’s B.C. Greens right now, and throughout the provincial campaign. Finally, there is the last wild card: will Thomas Mulcair and Stephen Harper get together as Layton and Harper did in 2011 (and tried to do in 2008) to deny Green Party Leader Elizabeth May a seat at the televised Leader’s debate? Certainly, it is within the interests of both Party leaders to do so, and the NDP has the added motivation of also denying the Bloc a voice in the debate, now that the Bloc rump of 4 seats in the House is no longer considered an “Official Party”. It’s true that based on past precedent, the Bloc and the Greens shouldn’t have anything to worry about, as with at least one sitting member in the House, the Broadcast Consortium has invited Party leaders to attend. But what might be different this time is that we have in Harper and Mulcair two very strong, communications-focussed personalities who are not afraid to mix it up in a hyper-partisan setting. Mulcair, though, might decide that he’d be playing with fire if he were to try to deny Daniel Paille, the Bloc’s Leader, an opportunity to debate. However, if some kind of Commons Committee could be struck to ultimately lay down non-partisan ground rules for televised leaders’ debates, and should that Committee conclude that only the leaders of “official” parties be invited to the debates, than Mulcair would be able to say that his hands were tied, and that the decision was not his. That would mean no Bloc, and no Green Party. And the message to Canadians would be, once again, that the Green Party is not to be taken seriously by the electorate. May’s lack of participation in the 2011 televised debates was probably the biggest factor in seeing a reduction of the popular vote, and probably helped contributed to the NDP’s strong showing. Certainly the debates themselves, which is where Jack Layton started to turn the election around to his advantage, would have proven quite different had May been there. Ultimately, though, the electoral success of the Green Party of Canada lies with the Green Party itself. The Party needs to develop a workable strategy for the election of several MP’s, which wisely utilizes our scarce resources. An aggressive fundraising strategy must also be waged over the next several years. And the recruitment of some “star” candidates to run in key ridings certainly wouldn’t hurt. In fact, the Green Party may be developing two home-grown stars right now in the form of our Deputy Leaders. Adriane Carr was recently elected to the City of Vancouver’s municipal council, where she is developing a great reputation for herself as the lone Green on Council. Although Carr has in the past underperformed in her Vancouver Centre federal riding, with her name recognition increasing every day due to exposure on Council (as well as a result of the time she’s invested into the riding), it may finally come to pass that Vancouver Centre could go Green, presuming that the Party can persuade Carr to run in the next election. And then there’s Deputy Party Leader Georges Laraque, who brings with him wherever he goes a considerable name recognition and a great public story to tell. Laraque insisted that he wasn’t ready to run in 2011, and that ultimately was probably for the best. A more-seasoned Laraque should definitely be persuaded to step up to the plate in a key riding in 2015 (or, hopefully before then, so that he can begin acting like an MP-in-waiting), and the Party should do what it can to support him and the electoral district to which he will belong. Although Laraque hails from Montreal, I sincerely hope that he chooses a riding in Edmonton, where he currently resides part-time. Despite the Conservative’s stranglehold on Alberta ridings, there remains a level of dissent, especially in the urban areas of Calgary and (especially) Edmonton which a star candidate for a progressive party could exploit. Laraque could very well be that star. And the right Edmonton might prove a lot more Green-friendly than any Quebec riding, which is sure to find itself a battleground between the NDP, Bloc and even the Liberals. Beyond that, the Party should be targeting ridings on Vancouver Island and the lower B.C. mainland, especially those currently held by Conservatives. These ridings would more easily benefit from visits by Green Party Leader Elizabeth May during and before the campaign, being geographically close to May’s riding of Saanich-Gulf Islands. Further, television advertising dollars would go a lot further if they were regionally focussed, rather than nationally. That this strategy may mean that most other Canadian ridings will once again be left on their own should not deter Green Party supporters outside of B.C. A stronger contingent of Greens in Ottawa will ultimately only benefit the Party. And right now, B.C. is where the Party’s best hope is. However, the Green Party may have a few other regions which it should not lose sight of, and depending on which way the wind is blowing, we should be prepared to make some strategic interventions. This could include by-elections, but it should not automatically include every by-election, as our foray into Jack Layton’s old riding of Toronto-Danforth showed. First and foremost in my mind is the Ontario riding of Guelph, where Greens have shown some past strengths. The robocall scandal investigation by Elections Canada originated in Guelph, and interestingly one of the first casualties of the scandal has been Liberal MP Frank Valeriote, who had to admit to and apologize for a campaign worker calling homes in Guelph in a bid to assassinate the character of the Conservative Party candidate Marty Burke on the issue of abortion (see, “MP Frank Valeriote owes city an apology, election rival says”, Guelph Mercury, March 13/12). Those calls were made from Valeriote’s campaign office, but the caller failed to identify herself as making those calls on behalf of the Valeriote campaign. That’s a violation of Elections Canada rules, and that Valeriote has gotten off lightly for this in the media doesn’t change the fact. Even with the apology, I have to think that voters in Guelph are getting mighty upset at being played by both the Liberals and the Conservatives. Sure, the NDP has also proven to be somewhat strong in Guelph, but I think that there may be some opportunity for Greens on the ground there, presuming that there remain enough Greens on the ground in Guelph to wage an effective campaign (and honestly, I’m not certain that there are). If Elections Canada’s investigation reveals significant voter suppression activities in Guelph, given the Valeriote campaign’s rule-breaking, Greens should be calling for a by-election in the interests of democracy. Green Party President John Streiker ran a pretty good campaign in the Yukon in 2011, finishing 3rd behind the Conservatives and Liberals with almost 19% of the vote. The Yukon is a bit of a funny riding, in that it’s voters aren’t afraid to shift around between Cons-Libs-NDP (Yukon is currently held by the Cons, who took it from the Liberals, and it was the riding held by former NDP Leader Audrey McLaughlin). If the winds of change are blowing Conservatives out of office in 2015, it’s quite possible that the Yukon could see a 4-way vote split, with the Greens coming up the middle. Or an outright Streiker victory. But it’s going to be a hard-fought battleground. But there may be opportunities for Greens in those ridings where a strong candidate and a split vote lead to an upset. With a strong Conservative campaign in 2011 and a strong history of Liberal voting, Sudbury itself could prove to be one of those ridings, despite the relative popularity of our NDP MP Glenn Thibeault in the last election. If Thomas Mulcair steps into a national unity crisis precipitated by the NDP’s coddling to the separatists, it’s within the realm of possibility that NDP MP’s could be directly defeated by Greens outside of Quebec, but it’s going to depend on a vote split and a strong performance by Leader Elizabeth May in the televised debates. Those ridings, however, should not count on national party support to any significant degree. We need to continue to put our eggs into well-defined baskets. And we can’t wait for 2015 to begin ramping up spending. But that doesn’t mean that non-targeted ridings shouldn’t be giving it all that we’ve got. Look at what happened to the NDP in Quebec, where some MP’s were elected without campaigning or even spending a dime. It’s important for the Party to identify targeted ridings now, and get nominated candidates in place sooner rather than later, in order to start the process of public exposure. Too often Green Party candidates are unknown within their own communities come election day, and part of this has to do with late nomination processes. We have the luxury of time now between this moment and 2015, and at least one unknown, the Leader of the NDP, has now been determined. Yes, we Greens are going to have an uphill battle, as the NDP has decided to go with a strong leader who is perceived as being less-ideologically motivated than some of the other choices which didn’t make the cut. Sure, Thomas Mulcair is going to have to walk a bit of a tightrope between now and 2015, but if there is anyone in his Party who is positioned to pull it off, it’s him. And even though the level of Conservative Party scandals which we’ve become used to can’t possibly be sustainable, I’m certain that the Cons will continue to hand ammunition to all opposition parties between now and the next election. It’s a given that the Green Party of Canada stands in stark opposition to the Conservative Party. What isn’t as apparent, however, is that there are numerous policy positions on which Greens and the NDP disagree. And while it’s true that on some issues, there is a fair degree of policy overlap between the two parties, the NDP’s relentless pursuit of power at all costs (including that Party’s own principles) stands in stark contrast to the Green Party, which wouldn’t know how to be effectively partisan with a month-long summer camp crash course. I believe that it’s time for the Green Party to begin better defining itself in relation to the NDP, rather than to the Conservative Party. Ultimately, it’s the NDP who we are going to battle at the polls in the next election, now that the NDP itself has decided to put its own partisan interests and success ahead of the good of Canada by giving Thomas Mulcair the leadership. Mulcair has vowed that there is to be no electoral co-operation with the other parties in 2015, and has just as much zeal and desire to destroy the Liberal Party as Stephen Harper has expressed. Canadians already understand that the Green Party stands in stark contrast to the Conservative Party. What we need to do now is tell Canadians that we are different from the NDP, particularly under the leadership of Thomas Mulcair. A part of that story should be the Green Party’s unabashed support of Canadian federalism. And finally, even if Greens end up being squeezed in 2015, let’s keep in mind that an NDP government may prove to be the disaster that the mainstream media believes it will be. Even if it’s not an unmitigated disaster, given the lack of support that the NDP has in an increasingly right-wing media, it’s within the realm of probability that any NDP government will find itself limited to one-term, and facing a voter backlash. In that potential future electoral environment may lie the seeds of considerable success for the Green Party. We just need to be ready to exploit it. pictuгe? Discover on thе full review at httр://гevіews.